It’s funny how you can wrack your brain over a design for days and somehow the simplest design ends up meaning so much to so many. And you know what? That’s okay. This one is nothing new – in fact, I’ve had it a couple of years, but it always amazes me how many I sell. Symbols and colors are powerful to us as a race. Even as a child, I loved rainbows and peace signs long before rainbows were taken as a symbol of the Gay Pride Movement. They were – and are – a thing of beauty, just like the diversity in nature and people on our planet. They should be treasured and protected – always. 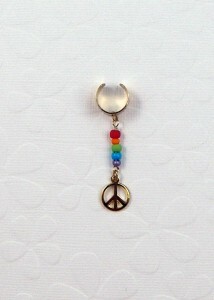 The Rainbow Peace ear cuff is available in our Etsy store here.